Lippe-Detmold lies in the Nordrhein-Westfalen, north-center Germany. Its library has an almost four centuries long history, survived both world wars and offers today an important cultural center in the region. Sometimes, libraries are anyway also places for interesting discoveries. This is also the case of Detmold library: only in 2005 a considerable number of documents collected during the WWI – i.e. a large amount of trench newspapers and manifestos that had been gathered but never recorded and catalogued – were discovered in the storehouse for the first time listed and finally predisposed for the consultation. The documents were of so great importance that they were even arranged in an exhibition, from which a printed catalogue was published by Julia Freifrau Hiller von Gaertringen (Die Kriegssammlung der Fürstlichen Bibliothek Detmold. Soldatenzeitungen des Ersten Weltkriegs in der Lippischen Landesbibliothek, Detmold, Lippische Landesbibliothek, 2010). The Detmold collection is not the most important nor the most large in Germany, it is however an intelligent selection of a wide variety of publication and collect rarities, so that the printed catalogue offers to those who couldn’t visit the exhibition or cannot consult the documents a useful introduction to this special genre of writings. Each belligerent state, each Army, even each battalion printed its own paper and feuilleton. It is even funny to imagine how the editing team of these journals could work in the precarious situation of the conflict, moving besides the battalions, constantly faced with the problem to find paper, ink and typographical material in the occupied cities or in the front. The great amount of this sort of war publications drew the attention of the German War Ministry, which organized starting from 1916 a special office appointed to gather and select all printed material (not only trench newspaper) produced during the WWI and then to deliver it to the libraries. Even if this office was animated more by a censorship intention then by a cultural purpose and wanted to control strictly the exchange of information between front and home, libraries were able to collect newspapers also applying to a mutual support – from 1916 in Wien a special review – the Kriegssammler Zeitun – offered an up-to-day list of the trench newspapers and their last issues; then from 1918 the libraries interested in the topic joined in an association to share the collected documents –, sometimes using the black market – fakes had circulated even during the last years of the conflict and few copies are available also in the Detmold collection –, subscribing directly for the trench newspaper, or using personal relationships with the soldier. All these ways were exploited by Ernst Anemüller, the director of the Detmold library during the Great War, being aware how perishable this writings are. From his intelligence in selecting and tracking down the issues results this small, yet precious collection. (On German trench newspaper, see also Robert L. Nelson, German Soldier Newspaper of the First World War, Cambridge University Press, 2011). The German trench journals look like – at least in their general features – to all other trench newspaper of the period. 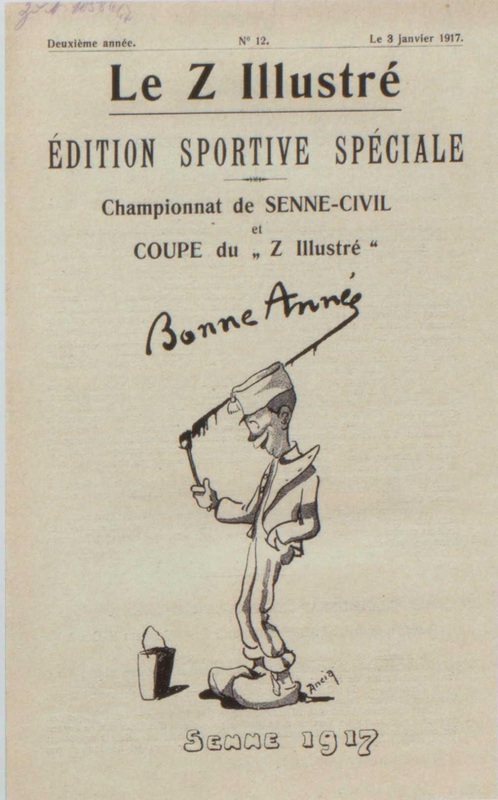 They were sometimes published by the Army with a general patriotic purpose (the military and strategic peculiarities never discussed) and overly optimistic, depicting therefore the life in the trench as even joyful (for example using funny illustrations to describe how versatile and useful could be an empty can). Unofficial soldier-produced newspapers (printed or not) give even nowadays to the reader a smile with their satire against the adversaries or the war, with their jokes and cartoons. Publication of hospitals or lazarets are a chapter apart. Also the journals printed in detention camps deserve special attention, as for example Quousque tandem, a review issued for the 28.000 German who were imprisoned in October 1916 in the Isle of Man, or the weekly newspaper Le Z illustré, published by Belgian and French civil prisoners from January 1916 in the Camp of the Senne and printed in Paderborn. Beside the content, there is also a formal dimension of this writings, which is sometimes neglected, give yet a glance into the First World War. Sometimes they offered illustrations of a considerable artistic value. One of the most interesting example is Die Sappe, established by a Bavarian company settled down in the south-western front, near Colmar. This small journal, whose reference, jokes and even dialect are completely Bavarian, offered a series of pictures by the illustrator Karl M. Lechner of wonderful quality. There were however more banal aspects, for example, the question how to provide the "Fraktur" or "Gothic” types for the printing. As the German army on the West front tried to use the typographical material available in the occupied cities they soon realized that they could print only in Latin Antiqua, that some letters were therefore not existing (i.e. ß, ü, ä, etc. ), some others were not enough (w, k or vocals without accent). They had therefore to let them send the letters stamps from the homeland, if they wanted to print in “Fractur”, so as they were forced to do in the East front, where the Cyrillic type was useless for any German trench newspaper. On the other hand the curios history of the Nea Tou, a journal printed in Greek letter stamps for 6500 Hellenic soldiers, who were kept as “free prisoners” in Görlitz, near the German-Polish border from September 1916 till the end of the WWI and who were able to create around this newspaper not only a linguistic, but also a cultural community. Trench newspapers offer a sort of radiography of the Great War from every point of view not only in their content, considered also from a polysemantic point of view (as interconnection of propaganda, censorship, creation and expressions of wishes, hopes, fears, engagement), but also in their material features, that are a result of linguistic and geographical interconnections, woven to satisfy the inalienable human need to communicate.